"I love this product as well as other Dermed products...I have oily skin and it moisturizes without making my skin oily." Monique W.
The Institut' DERMed Clarifying Moisturizer is formulated with plant derived Squalene Oil and Tea Tree Oil to restore the skin's ideal moisture balance and decongest pores for a clean, clear complexion. A serious oily skin moisturizer formulated without: parabens, mineral oil, sodium lauryl sulfates, phthalates, artificial dyes or synthetic fragrances. Products not tested on animals. Smooth onto the face and neck with finger tips until absorbed. 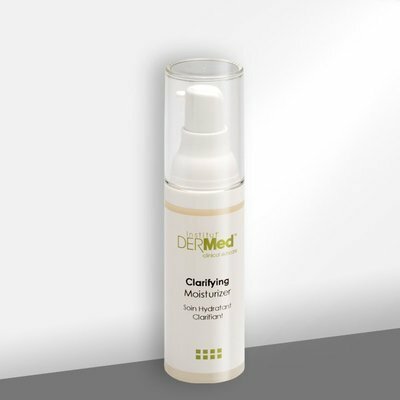 For added protection during the day, follow with the Institut' DERMed Brightening Moisturizer. Olive Squalene Oil - derived from olive oil and used as an antioxidant to hydrate and soften the appearance of fine lines and wrinkles. Tea Tree Oil - also known as melaleuca is a gentle alternative to benzoyl peroxide and helps to maintain a comfortable complexion. Aqua (Water), Glycerin, Helianthus Annuus (Sunflower) Seed Oil, Caprylic/Capric Triglyceride, Prunus Armeniaca (Apricot) Kernel Oil, Saccharide Isomerate, Punica Granatum Extract, Squalane, Orbignya Speciosa Kernel Oil, Xanthan Gum, Algae Extract, Pyrus Malus (Apple) Fruit Extract, Astrocaryum Murumuru Seed Butter, Melaleuca Alternifolia (Tea Tree) Leaf Oil, Chlorella Vulgaris Extract/Lupinus Albus Protein Ferment, Pectin, Hydrolyzed Glycosaminoglycans, Sodium Hyaluronate, Foeniculum Vulgare (Fennel) Fruit Extract, Isohexadecane, Polysorbate-80, PPG-3 Benzyl Ether Myristate, Acrylamide/Sodium, Acryloyldimethyltaurate Copolymer, Iodopropynyl Butylcarbamate, Sodium Benzoate.